Looking for a great way to use up your scraps of card stock? The June TJNL has a great technique for the Stamped Bargello Technique. I stamped the following images on my card stock - Fifth Avenue Floral, Baroque Motifs, Dreams Du Jour (all Stampin' Up! 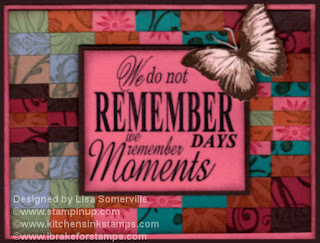 ), the sentiment is from I Brake for Stamps, the Butterfly is the 3 Step Butterfly from Kitchen Sink Stamps. Both the sentiment and butterfly are popped on dimensionals. Oh my gosh, that card is stunning. I love how you used all those scraps!!! I have to check that out and give it a try. Off to grab my scrap bags and give this a try! oooooh! aaaaah! so pretty! love that scrappy background!